How do I send emails to a group? Sometimes you need to act as the “town crier” for a group or want to send out emails to the same bunch of friends. Making sure that everybody is on the “cc” list can get to be a chore and it is easy to miss somebody. Mail clients let you set up “groups”. In Live Mail they are called “categories”. So the first step is to collect your recipients into such a group. Then sending emails repeatedly to the same group is a snap. Here are the details for doing so in Live Mail. Open your Live Mail client program. 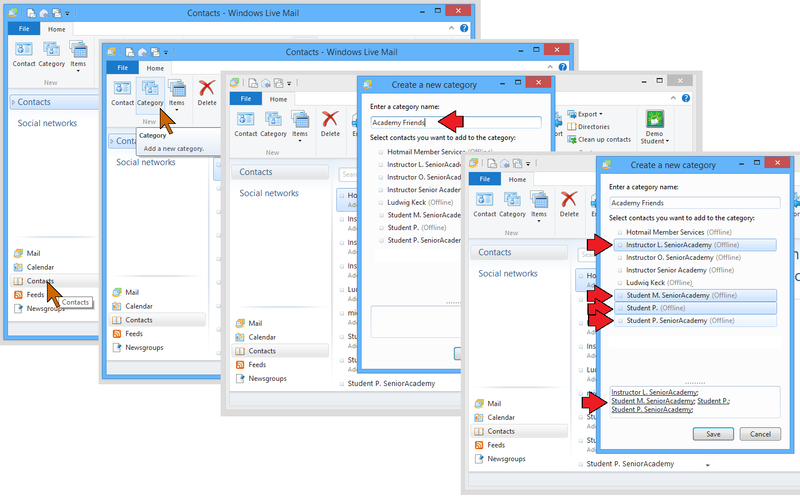 Click Contacts in the lower part of the left pane (see illustration below). Click Category in the New group of the ribbon. A “Create a new category” dialog opens. There is a place to enter a name for the group. Do so. Your contacts show in the dialog. Click all the ones you wish to include in the group. The selected contacts will show up in the box toward the bottom of the dialog. You can type in email addresses of others in the box at the bottom. Separate them with semicolons. When you are finished adding recipients to the group click Save. That’s all there is to setting up a group. To send an email to the group is quite simple, but there are a couple of precautions to observe. You can prepare the email as you normally do, or even start by forwarding an email as you would normally. Here are the rest of the steps. It is never good to show the email addresses of all your recipients in the emails. The proper way is to use “bcc” to hide the addresses. 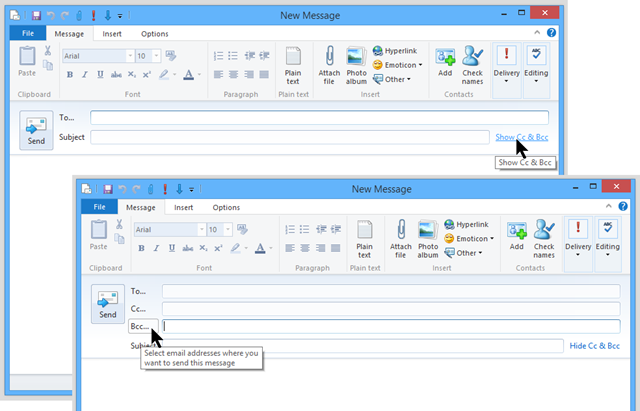 Open Live Mail and start the new message as you normally would. To the right of the Subject entry box click Show Cc & Bcc (unless the Bcc field is already open). Click Bcc… in front of the entry field. This opens a new window showing your contacts including your groups. Double-click the name of the group. The group will now show in the Bcc field at the bottom of the window. Add your own email address in the to To… field. Finish the email and send it as you normally would. Do remember that your friends don’t want to be spammed. Group mail should not be misused! How do I prevent creating sub-folders when importing photos? What is that “Links” item on the Windows 8 taskbar?